// Luckily Strombo alerted me to this amazing project that Tim Burton created. It’s a social media story telling experiment usting Twitter, running from Nov 22 – Dec 6. You can tweet your version of a continuation of the story in Twitter using the tag #BurtonStory, and the best tweets of the day will be selected to build the story. 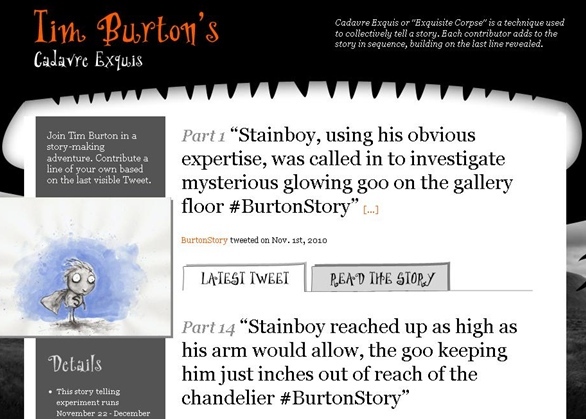 Here’s the intro (same as above): Stainboy, using his obvious expertise, was called in to investigate mysterious glowing goo on the gallery floor #BurtonStory. Check it out @ http://www.burtonstory.com.